When it comes to portable stage systems, choral risers, seated risers, catwalks and ramps, Intellistage™ is world renowned for creating the highest quality, most innovative modular staging products on the market today. A pioneer in modular staging design, Intellistage continues to lead the market with innovative products and a wide range of product offerings. We welcome you to join our growing family of satisfied customers worldwide which include numerous Fortune 500 companies, universities, schools, government organizations, houses of worship, luxury hotels, resorts, military organizations and more. We take pride in creating quality products that offer a great value. 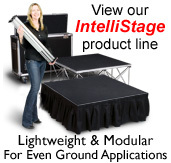 Intellistage™ stages are completely modular and customizable. Platforms, risers and other components are available in either pre-packaged stage kits or on an individual basis so that our customers can create a custom stage (in different heights, shapes configurations and sizes) to fit their needs. We even created our exclusive Stage Builder software which allows our customers to easily design their perfect stage instantly online. The good news is that as your needs change, so can your stage system. The beauty of Intellistage is that it is completely modular so you can change the size, shape or height of your stage as needed (*to create some configurations it may be necessary to add new components to your existing stage). We also offer a full range of accessories like stage skirts, storage/transportation systems, stage back drops, choral risers, seated risers, guard rails, mobile stage kits, ramps, stairs and more. Intellistage... Easy assembly, compact storage. 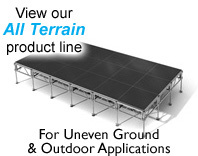 Intellistage offers the most portable staging value on the market today. Our Stage platforms and risers are so lightweight and compact that a stage can easily be assembled quickly in a matter of minutes by just one person! When it's time to break down, you'll find that disassembly and storage of your stage is equally convenient. Platforms and risers are so compact that they can easily fit in most cars or trucks! Optional storage flight cases, caster board and dollies for transporting and storing your stage are also available. Sizes (U.S.): 8", 16", 24" & 32"